From classical roots to wide-ranging sweeps of punk, beatboxing, jazz and pop. 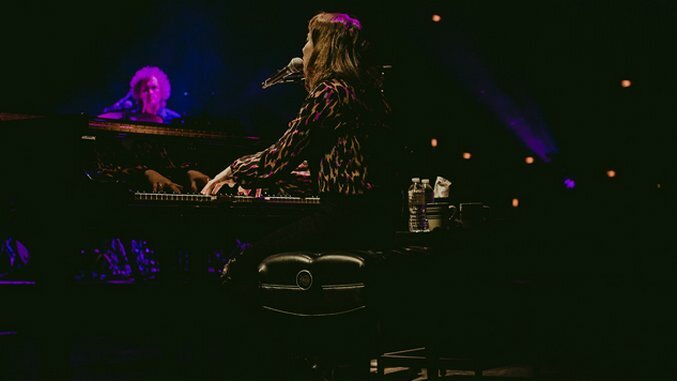 Although she began as a classically trained pianist, singer/songwriter/instrumentalist Regina Spektor has earned both critical acclaim and commercial attention with her take on the anti-folk genre. Born in Moscow, Spektor emigrated to the United States at age nine. The rest of her formative years were spent absorbing all of the culture that residing in the Bronx had to offer. After studying at the SUNY Purchase Music Conservatory, playing everywhere she could throughout the city in her spare time, Spektor kickstarted her career by opening up for The Strokes, an experience she describes in Lizzy Goodman’s recently published Meet Me In The Bathroom. Over the course of her career, Spektor has evolved from her classical roots to wide-ranging sweeps of experimentation throughout punk, beatboxing, jazz and pop. Spektor’s first effort, 11:11 was an independently-released effort from 2001 originally only available at her shows. Since then, however, Spektor has crafted six other LPs, with albums like 2006’s Begin to Hope and 2012’s What We Saw from the Cheap Seats hitting particular high marks. Since 2016’s lauded Remember Us to Life, Spektor has been touring throughout Europe, the U.S. and Canada in support of her newest record. This Thursday, July 27, she return to New York City to perform at Central Park as part of their Summerstage Concert Series, symbolizing a personal homecoming and a hallmark of what she’s achieved in her career thus far. Here then are Spektor’s 10 best songs. “Hero” paints a near picture perfect image of the gut-wrenching aftermath of unexpected heartache. The simplicity of the arrangement—just Spektor’s voice accompanied by piano—makes this song all the more powerful and allows the lyrics to shine. Her repetition of the simple refrain, “it’s all right,” is a universal sentiment of authentic (or at least attempted) reassurance. And because we’re all at the center of our own universes, the heroes of our own stories, sometimes complete denial is the only salvation. Listening to “Small Bill$,” another song off of Remember Us to Life, feels a bit like taking a journey into Spektor’s subconscious. The lyrics sound a little like something out of an Allen Ginsberg poem. They don’t exactly make sense, but they have an irresistible sense of urgency that’ll have you singing along before you realize it. After years of writing piano ballads, it’s easy to understand why Spektor might be aching to switch things up a bit. This song is her most creative attempt to do just that, having fun and venturing away from her roots without worrying what her fans and critics alike will say. One of Spektor’s more playful tracks, “Don’t Leave Me (Ne me quite pas)” from What We Saw from the Cheap Seats is an ode to two of the greatest cities in the world, New York and Paris. While “Don’t Leave Me (Ne me quite pas)” celebrates these locales, Spektor also acknowledges the loneliness that often accompanies dwelling in either, pleading with the listener not to leave her behind. Her first real foray into a more experimental sound and surreal lyrics, the synth-based beat and incorporation of horns combine to make “Don’t Leave Me (Ne me quitte pas)” one of her catchiest, easiest to sing along with hits. “On the Radio” is a masterpiece that manages to weave together another classic piano-led beat, images of death and decay, a Guns N’ Roses reference and a near perfect portrayal of the human condition. This song is one of Spektor’s most engaging to hear live, as you can count on everyone else in the audience to hum along. In the second verse she sings, “This is how it works, you peer inside yourself / you take the things you like / then try to love the things you took / and then you take that love you made / and stick it into someone else’s heart / pumping someone else’s blood / Walking arm and arm / you hope it won’t get harmed / but even if it does / you’ll just do it all again.” If that’s now what love is, we’re not sure what else it could be. Best known as the theme-song to Netflix’s Orange Is The New Black, “You’ve Got Time” is Spektor’s most heavily rock-influenced track with its heavy drum beat and electric guitar riff. Chock full of prison metaphors, it perfectly sets the mood for a binge-watching session, yet, don’t let that lead you to assume that it can’t stand alone as a strong track. As evidenced by tracks like “Older and Taller” and ”Time Is All Around,” Spektor is no stranger to playing with notions of the speed at which times passes, and the sense of angst and entrapment that features prominently in “You’ve Got Time” helps it translate to a variety of contexts. Another track off of Begin to Hope, “Samson” showcases Spektor’s full vocal range; her clear falsetto calls out, “I loved you first,” to devastating effect. Meanwhile, it effortlessly evokes the sense of futility one feels in the face of a withering relationship and their nostalgia for what once was. As Spektor sings, “We couldn’t bring the columns down / We couldn’t destroy a single one / and the history books forgot about us / and the Bible didn’t mention us / not even once,” you have to wonder if all of the heartbreak and struggle is worth it for her. Yet, Spektor’s recollections of being “kissed ‘til the morning light” seem to hint that there’s something beautiful even in the downfall. One of Spektor’s heaviest tracks, “Laughing With” off of 2009’s Far is a solemn take on the dichotomy between rejecting the notion of God only to become desperately faithful in the next moment of crisis. Spektor’s use of rhyme in this song is especially noteworthy; her usual singsongy, almost childlike structures only emphasize the sense of irony pervading the track. Near the end of the final verse, just when Spektor has you feeling ready to repent for your blasphemy, she turns the tables on the listener, reminding us that, just maybe, God is in on the joke. The lead single off Begin to Hope, “Fidelity” is the song that established her as a singer-songwriter to look out for in 2006. Maybe it was her way of melding classical and indie elements that helped the track gain traction, but perhaps the universal fear of rejection encapsulated in her lyrics was even more vital. Listening to Spektor croon, “I’ve never loved nobody fully / always one foot on the ground / and by protecting my heart truly / I got lost in the sounds,” you simultaneously sympathize with her hesitations and want to take action in your own love life before it’s too late. The song at the helm of the indie soundtrack for 500 Days of Summer, “Us” is one of Spektor’s catchiest and most instantly recognizable songs. From the instant it begins, the grandiose piano riff and string instrumentation capture the listener’s attention. This sound perfectly melds with the imagery of the larger-than-life romance at the heart of the song’s narrative. The highlight of the song is undoubtedly its chorus, which features Spektor’s best wordplay; the repetition of final syllable of the word “contagious” neatly tying in with the title of the track. Simply put, this is Spektor at her best.